It would be very informative if the viewers received more objective reports from both sides of the war and from public opinion in various countries surrounding the countries at war. I have noticed that the length of one sided reports and the variety of sources are biased and tell more about the victims of Serbian "crimes". I have not heard much on US television about the decade long "genocide" going on during the 80's and about forceful evictions, rapings and interrogation of Serbs in Kosovo. Hundreds of thousands of Serbs were scared into leaving Kosovo. There was a famous march of the civilian victims in Kosovo asking the government in Belgrade to send the army and more police for their protection. The Yugoslavian People's Army moved into Kosovo with tanks after this cry for help. I can attest to it because I lived in Macedonia during those fearful years of economic and national crisis. From a political standpoint, the war in Kosovo was wrong; however, from the stand point of someone who has simple human values, the war was justified. There were many reasons that NATO chose to fight in Kosovo. These reasons were lie in the grey areas between public opinion. Anyone who can watch conflict endure for centuries, as was what happened in Kosovo, until NATO stepped in. I must remind people that the real cause for this war is not just the politicos. It is humanity as a group, unlike Macchiavelli, who would have us believe otherwise. There are two ways one can approach the NATO 1999 intervention in the Balkans, from the point of view of Machiavellian realpolitik as a warmaking politician, diplomat, or general might, and, as a human being. There there is no "third way," as suggested by supporters of NATO's air war who insult our intelligence by implying that such a war somehow constitutes a "New Military Humanism," to borrow an ironic phrase from the title of a 1999 book by Noam Chomsky. ... Frontline's "War in Europe" very ably showed how, right to the end -- and that "end" was the beginning of the air war --politicians like Bill Clinton and their minions like Sandy Berger sent Mr. Milosevic the message that any war fomented by NATO would be fought with NATO's most powerful fighting hand ground troops tied behind its back. ... I believe that all the principals in the 1999 NATO War in the Balkans must be indicted and tried at The Hague -- including Bill Clinton, Tony Blair, and any cabinet members and NATO officials who were complicit in this war which killed and maimed hundreds of defenseless civilians, and wrecked their economic futures, from the relative safety of bunkered command posts and high-flying supersonic jets. I am wondering why hasn't there been any major comments from Bush or Gore on how they plan to handle this situation in the future? Clinton is leaving office with our foreign affairs in disarray. Frontline showed Yugoslavia's troubles.What about Pakistan, Afghanistan, Iraq, Russia, and The Middle East? Our next President is also going to have to pay for Clinton's bombings. Why isn't foreign affairs a major issue so far? an attempt to make scapegoats of Madeleine Albright and Gen. Wesley Clark, and Mar99 London summit and Nov99 SACLANT delegate Stephen Henthorne's posting here seems to be one. No matter whose idea the unconditional occupation/surrender ultimatum -- Appendix B of the Rambouillet Treaty -- was, our elected leaders had to approve its use and the resulting war. Albright and Clark could not order the beginning of military action themselves. Only President Clinton -- closely advised by National Security Advisor Sandy Berger -- and Secretary of Defense William Cohen could do that. And they ... and their British and other NATO equivalents ... bear the primary guilt for beginning the Kosovo war and the resulting deaths, suffering, and even deeper hatred. The British opinion magazine THE SPECTATOR est. 1828 has just publicly accused Clinton and British Prime Minister Tony Blair of WAR CRIMES, for starting the unnecessary Kosovo war. It will be interesting to see who doesn't have a chair, now that the music is stopping ... now that the reality of the Kosovo mess we caused and got ourselves into is growing before us. The question is "How long can the propagaitors keep preaching their falsifications"? How is that you can put something on television with absouletely no proof what so ever and have the entire West believe it. When you air such one sided, demoralizing, demonizing material it's makes a lot of educated people wonder. Is there a law in this world? NATO clearly demonstrated that international law does not apply to them. The United States instead of helping less fortunate nations decides to bomb them back into the stone ages if they do not comply with american demandes. But what do you say when you travel the world and someone asks you where are you from? You reply "I am Canadian." Now unless your in Britan or Germany you are hated all over the world! You fall in the same boat as Americans do. Being hated all over the world for your democratic ways. How long will the West push the East, when will they realize that their pre-school level of politics doesn't work! Kosovo is NATO's biggest failure and actually their first real mission. The truth about Kosovo is slowly pouring out, propagators are trying there best. But it doesn't take a genious to figure out that KFOR has been in Kosovo for over half a year and there are still no pictures of mass graves. The death toll all of a sudden is 2,100 - whom are from all ethnic backgrounds. The 100,000 slaughtered Albanians have yet to be found in an area so small that you could walk accross in a day. The truth always comes out, and in this case all I can say is choose your sides wisely - those who go down will go down big.. I resent your phrasing of the question on my opinion of NATO's recent actions in Serbia as if the "ethnic cleansing" in Kosovo was a fact rather than an interpretation of other events. I am deeply gratified by the large number of other viewers who are deeply offended by your presentation of the material related to the recent attrocities committed by NATO in Serbia. Bosnia, Croatia, Kosovo are all part of Yugoslavia. If the restive ethnic groups in Yugoslavia wished to have more autonomy, the surest way to help them and not bring on a blood bath, was to assert Yugoslavia's right to maintain its national integrity. It may then have been possible to work within the Yugoslav system to win more local autonomy for the various geographic areas. It is possible to draw more of a parallel with the recent events in Yugoslavia and our own civil war than with the German attrocities on its ethnic minorities. But our state department, under the weak leadership of Madeleine Albright and Richard Holbrooke, is unable to muster enough courage and imagination to determine a truly effective course of action. I watched your show with fascination, not at the fact that you presented new information, but rather at the volumes of information you did not present. Your presentation also failed to answer the question of why. Why did our country insist on utilizing weapons of mass destruction that are outlawed by international law? Cluster bombs which, by the way, have already killed about 75 people in Kosovo "after" the end of the bombing and depleted uranium were used. The cluster bombs will continue to kill for years to come. Why did NATO violate its own charter, the geneva convention, the UN charter, and international law in this attack? Why was the War Powers act of 1973 not respected by our President, even in the face of a clear lack of authorization by congress? Why does our country only seem to interfere in conflicts where the "enemy" is not a nuclear power, a trading partner, where the victims are caucasian, and where the conflict is widely covered by the press? The ICTY claimed that only 2,108 bodies had been found in Kosovo it refuses to break the number of dead by ethnicity, cause of death, etc. to date, this after intensive efforts by forensic teams from several countries, including our own FBI. Without even going into the questionable number of 2,108 dead, compare this death toll after 3 months of full-blown war in Kosovo, to the 10,000 killed every month in Sudan. Why does the ICTY not respect its own charter and why does it accept most of its funding from the United States? I have enjoyed several of your programs in the past. Presenting multifaceted issues with minimal spin. However, your program "The War In Europe" was NOT one of your shining moments. 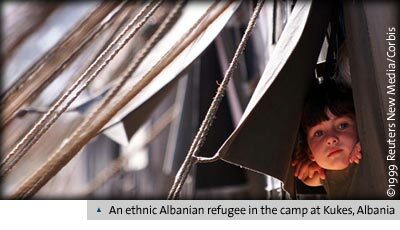 Is the life of an innocent Serbian worth less than the life of an innocent Albanian? Is the life of the Serbian conscript is worth less than the life of a Albanian insurgent? These are questions only God and politicians can answer. However, once the decision to bomb Serbia was made, bombing innocent Serbian citizens rather than bombing the indicted war criminal Slobodan Milosevic in his palace was criminal. The attempt to fight a non-war war is stupid. I agree completely with General Short, once the decision to go to war is made the politicians should have nothing to say about how it is fought. How ironic that the decision to go to war was made by a draft dodger. I guess he decided that Kosovo was more important than Vietnam and his life is more important than the lives of the young men and women he sent to fight and die. Whatever the case it's obvious that declaring this type of war is too important to be left to politicians. If only we had a national referendum atrocities like this would never happen again. The true criminals of this war are Madeleine Albright, Bill Clinton, Tony Blair, Slobodan Milosevic and Hashim Thaci. I wish to add my voice to all of the many contributors to this discussion on your coverage on the Kosovo campaign who also saw it as a big letdown and dissapointment. We all expected more from Frontline.... For one, this is supposed to be a representative democracy and the only direct mention of the US Congress in the two shows was a short sound bite from Senator Biden. You also fail to mention that in the middle of the air campaign the US House gave a resounding NO vote to a continuation of air war in Kosovo and Serbia. And the fact that again the US military has been employed to wage an illegal war against a sovereign country that has not attacked us is of no concern to both US policy makers or the producers of Frontline. Where are the voices of others such as officials of other NATO counties who did not approve of the bombing campaign. Why did they not approve? Could it be that they saw this as a gross overstepping of the limits of power by the US and Britain and a mission frought with many perils and potential for future backlashes - as we see now with the reverse ethnic cleansing of Serbs and Roma from Kosovo? Finally, Frontline could not find ONE PERSON to discuss the ethical perspectives of "imperialistic humanitarian intervention"? My only feeling of optimism is from the several writers to this forum who have shown that they have not been hoodwinked by the US/NATO propaganda machine regarding our "humanitarian" involvement. I have worked in Eastern Europe and Albania since 1991. Your program about the Serbia/Kosova conflict conveyed a realistic perspective about the future of that area. I expect that the Albanians in Kosova have not seen the last of the Serbs. How can you call your story on the war in Kosovo journalism when it failed miserably to tell most sides of the story? You presented almost exclusivly the views of the people who make up the US military industrial complex. Where were the people who were working for peace in your story? As if the ultimatums of unconditional surrender or war were the best options available. Your story abruptly ended on the note that the conflicts that have troubled this region for so long had only been temporarily suppressed. So more war and violence did not help solve the original problems, right, it only has bred more misery for the regular everyday people who are the ones killed so often in these 'humanatarian' wars. Is there such a thing as a 'humanitarian bombing' or a 'humanitarian war'? Is there such a thing as a 'smart bomb' when they kill people indiscrimenentally and cost us billions of our tax dollars? Why didn't the US/NATO have teams of peacemakers trained in non-violent conflict resolution go into the region for a substantive long-term negotiation towards peace? What about the CIA's role in supporting the KLA's campaign of violence? Where was the in-depth coverage of the history of the civil war in the region? Who are we to condemn and demonize acts of that might be genocidal when our own country has an unresolved history of such genocidal behavior against Native Americans and Africans? You all should do this story again with more depth and breadth of content. I took part in the Operation as an F-16 Pilot/Forward Air Controller out of Aviano AB. With that in mind I found your coverage of the Balkan crisis exceptional. Especially, from the political/military perspectives. I found it suprising the number of negative reviews of the show by other viewers. For me, the analysis of the sequence of events was very educational. I was very familiar with the restrictions imposed on target selection and the emphasis of target selection by consensus. However, the interaction of the politicians from Tony Blair and other NATO leaders was insightful. I spent 2 1/2 years patrolling Bosnia and seeing the resulting damage of the conflict on the civilian populace. In March, I watched the village to village destruction occuring in Kosovo and thousands of internally displaced persons hiding in the countryside. These first hand images solidified the justification of action in my cockpit. Ordinarily, PBS shovels so much liberal propaganda mush as to make it irrelevant as a news organization. Every once in a while, however, Frontline comes thru with a particularly hard-hitting piece, unwittingly perhaps. I especially enjoyed the video interviews of our daring darlings, Madeleine Albright and Strobe Talbot, as they were contrasted with the carnage and indiscriminate destruction of an innocent society and sovereign state. To whom do Americans appeal, now that "virtuous power" has been unleashed in the world? What virtue did bombing Yugoslavia back to the stone-age produce? Frontline brought the message home from Kosovo that the policies and decisions made by our elected officials were juvenile, vain, and disastrous. What would have been much more instructive, however, was to review and emphasize just who these American officials actually were--what their backgrounds were, what they've accomplished, if anything, and who their friends are. Frontline would have had a better story, and the American public might be better able to understand what happens when you place control of the United States Armed Forces into the hands of an oversexed, arrested adolescent with no conscience, his college roommate and former TIME magazine columnist, and a holdover from the last ramparts of the Che Guevera feminist fan club. What LBJ did in Vietnam, Bill Clinton did in Kosovo--but without the stealth. Liberalism, and especially the Democratic Party, have much to answer for. How did it come to be that "Stop the War!" came to be "Bomb the Serbs!" ? I have comments on one specific area at this time. In LtGen Michael Short's interview, Frontline asserts LtGen Short became an outspoken critic of the way he was allowed to conduct the air war AFTER the war was over. I was studying this conflict from day one for professional reasons, and LtGen Short was publically voicing his disatisfaction fairly early in the conflict. I remember thinking "This guy is either golden or he is retiring". Sadly, he is retiring. LtGen Short's integrity and leadership as well as his understanding of nature of airpower should serve as the real lesson learned from this conflict. Fortunately when I retired from the AF several years ago, I know I left behind many superb junior officers that will note LtGen Short's performance, and they in turn will teach my son, and all the other people's sons and daughters that will follow. I come from a long line of military men: my grandfather was a 30 year navy veteran and my uncle was the late Admiral Boorda. I was aboard the USS Pharris off Beirut Point on Oct. 23, 1983, the day of the bombing. I understand that some states and their leaders only respond to force. Such was obviously the case in Kosovo. Once we commit to using force, the military commanders must be allowed to do their jobs without the interfernce of politicians. This was the biggest lesson of the Vietnam War. Every time politicians get involved in what you can and cannot do militarily the situation ends in disaster. Only when the generals were allowed to take charge were the Serbians brought to the table on our terms. When will we learn? When will we stop allowing politicians to play armchair generals?